Neogen, a Lansing-based developer of food and animal safety products, has launched two new test kits for coconut allergens, which give results in 5 minutes. 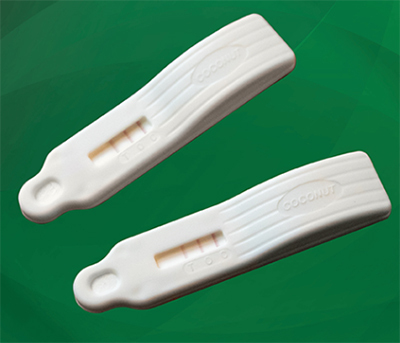 The company’s Reveal 3-D for Coconut Allergen screens environmental and liquid samples at 1 part per million Veratox for Coconut Allergen provides results in the range of 1 to 25 ppm for testing food and beverage samples. Neogen also offers screening and quantitative food allergen test kits for foods identified by the Food and Drug Administration as being of the most concern, including tests to detect tree nuts (almond, hazelnut, pecan, walnut, cashew, and pistachio), eggs, wheat/gluten, milk, peanuts, soy, crustacea (crab, lobster, and shrimp), and several others. Neogen’s Reveal 3-D format features three test lines, including an overload detection system designed to ensure highly positive samples are accurately reported. The test screens at 1 ppm coconut protein in environmental samples, clean-in-place rinses, ultra-high temperature processed beverages, and other beverages (e.g., coconut water, sports drinks, milk and enhancers).